Amira Bouchiba from EFI appointed new Marketing and Demonstrations Manager at CMYUK. Amira BouchibaUK based CMYUK, a leading UK solution specialist in super-wide digital print and the UK’s long-term partner of EFI, has appointed wide format digital print specialist Amira Bouchiba in the new role of Marketing and Demonstrations Manager. Amira has joined CMYUK from her previous post at EFI’s European demonstration and training facility in Brussels where she was a senior a VUTEk application trainer. Prior to her position with EFI, having initially trained as a graphic designer, she was responsible for technical training and customer support at Hewlett Packard. 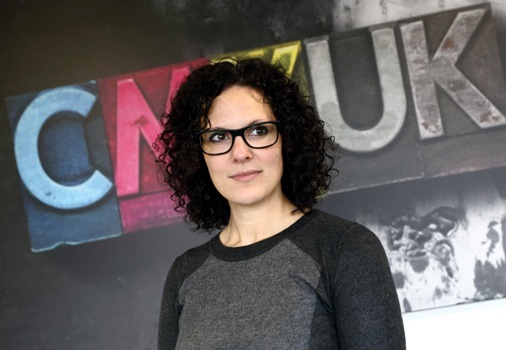 CMYUK Director Robin East said: “We’re delighted that Amira has decided to join the team as she brings with her a unique set of skills, which include an in depth, hands on knowledge of VUTEk wide format printing and the Fiery XF RIP. “As a leading solution specialist in super-wide digital print and the UK’s long-term partner of EFI, for this role we needed someone who truly understands our clients and their needs. As Marketing and Demonstrations Manager, Amira, who joined the company in October, will head up CMYUK’s demo centre in Shrewsbury as well as visiting customers. She commented: “I was really excited to join the team at CMYUK. I’d already worked alongside them for a few years at trade shows and customer training, and we share a philosophy of finding the right solution for the customer, whatever that may be. “As well as running the demo centre and building a new marketing and demonstrations team, I am currently focused on completing an ‘application wall’, where visitors will be able to see real life examples of work produced on the printers we have in house, and watch videos on how they have been produced. We’ll also be working on more short films for our digital learning channel on You Tube, helping our customers get the best from their printing solutions. “In addition, my role includes developing the ways in which we support our customers after they purchase a printer, including visiting them after they have received basic training to focus in on how they can deliver the applications they want to in the most efficient way, and delivering the best quality finish. “In my heart I’m really a technical person so it’s great that I can ‘keep my hand in’ with customers like this, as I understand their world – the environment they operate in, the technical issues they may face, and how they can optimise the results they get from their machines. For more information, visit www.cmyuk.com or call 0044 (0) 118 989 2929.